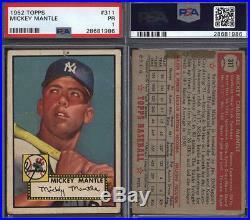 Offered here is a 1952 Topps Baseball Complete Set w/ Mickey Mantle Rookie HOF PSA 1 card. The owner of this set has many great memories about the pursuit of his first complete set. He lived in Lynbrook, Long Island and he traded cards with his friends to complete the first 310 cards, as a ten year old. All his friends and he were waiting for the last series to come out. They checked dozens of stores with no luck. Then, in October, he saw a box of last series cards. The store owner said he would only get that one box. The 10 year old ran to the food store where his mother was and begged for more than the usual nickle. He was able to negotiate for 35 cents. That 35 cents bought 7 packs containing 35 cards and seven sticks of gum. 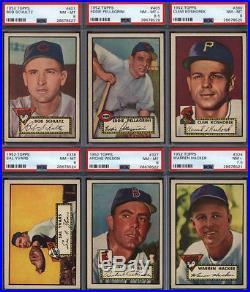 Those thirty five cards included almost all the the best cards in the set, Mantle, Robinson, Campy, Mathews, etc. He bought the set, keeping the cards he needed for the set and auctioned the rest in a Trader's Speaks ad. He ran dozens of full page ads in the Trader's Speaks and Sport Collector's Digest in the 70's. He opened a card shop in 1980, one of the first 20 shops in the country. Here's a complete breakdown of the set. #1 Pafko PSA 3.5. #48 Page (Sain) PSA 2.5. #311 Mantle PSA 1 Pinhole GREAT CENTERING!!! #312 Robinson PSA 2.5. #324 Hacker PSA 7.5. #333 Reese PSA 3.5. #405 Pellagrini PSA 8.5. Low Series (mixed Black and Red) 1-80: Range VG to EX/MT Avg. Mid Series 81-310: Range VG to NM/MT Avg. High Series 311-407: Range PR to NM Avg. High Series breakdown of ungraded cards. EX/MT or better: 18 cards (appx 20%). EX: 24 cards (appx 30%). VG to VG/EX: 25 cards (appx 30%). PR to GD: 17 cards (appx 20%). 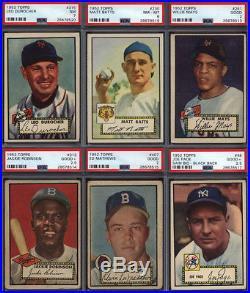 The item "1952 Topps Baseball Complete Set with Mantle RC HOF PSA 1, High #s PSA (407x)" is in sale since Thursday, June 7, 2018. This item is in the category "Sports Mem, Cards & Fan Shop\Sports Trading Cards\Baseball Cards". The seller is "just_collect" and is located in Somerset, New Jersey. This item can be shipped to United States, Canada.